How do I live with an empath? Many of my patients who are in a relationship with an empath ask how they can live with them. Empaths are extremely sensitive people and need their alone time. It is very important that you give it to your partner. Find out what your partner’s other needs are and try to factor them in to your decision making. For instance, if the person only likes to stay an hour or two in social situations let her take their own car so they can be comfortable. Traditionally, partners sleep in the same bed. However, some empaths never get used to this, no matter how caring a mate. Nothing personal; they just like their own sleep space. Speak up about your preferences. Feeling trapped in bed with someone, not getting a good night’s rest, is torture. The empath, however, must do his/her own work in managing their sensitivities. An empath without these skills can be very uncomfortable in their own skin and make their loved ones uncomfortable. 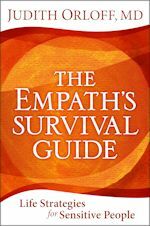 I suggest you both take a look at my book The Empath’s Survival Guide to learn and practice strategies for dealing with empaths. They will help!